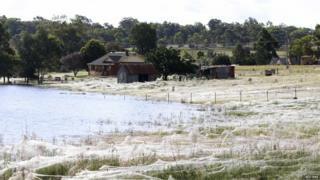 Check out these pictures of huge cobwebs in a flood-hit town in eastern Australia. The webs are thought to be an after-effect of the flooding - the spiders move away from the water and flooded areas to higher and drier ground. 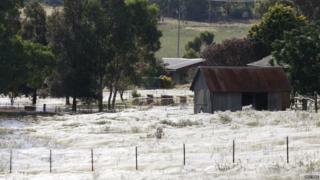 And the webs get bigger! It's happened in a part of eastern Australia, an area that's been hit by high rainfall and flooding over the last week. 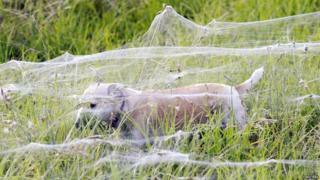 It means areas get covered in webs that wouldn't usually be - just like this field. 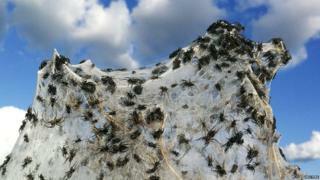 It might look like a scene from a scary movie, but these spiders are actually crawling outdoors in Australia. They're suspended in the air, their webs woven on sticks on a bush. This is a view of the nearby area that's flooded. 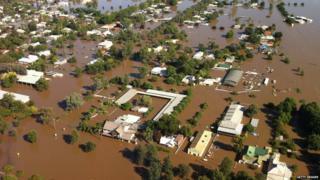 About 9,000 people have had to evacuate their homes in this town, Wagga Wagga in eastern Australia. It's thought to be the town's biggest flood for 150 years.